Los Angeles' first widely known car huckster, Earl "Madman" Muntz, was the area's premier big-personality media pitchman, and he made himself a household name from the 1940s well into the 1960s without ever appearing in his own billboard, radio or television advertising. That many longtime Angelenos think they remember seeing his bespectacled face or hearing his crazed-sounding voice over the airwaves is testament to his larger-than-life personality - and the ad campaign that made him a pop culture symbol of his time. "He was never seen, but there was an aura about him," said Mike Shore, 91, who more than half a century ago dreamed up the "madman" campaign that so perfectly suited the flamboyant Muntz. For nearly three decades, Angelinos heard jingles, saw billboards and witnessed some of his publicity-grabbing stunts at sporting events. His public persona was a 3-foot-tall, loony looking caricature of himself wearing red long johns and a Napoleon-style hat emblazoned with an M, which he used to hawk first cars, then TV sets and car stereos and other electronics. The campaign portrayed him as a madman, practically giving away valuable merchandise to consumers savvy enough to take advantage of his allegedly feeble mind. The campaign helped him make several separate fortunes over the years to support a lavish lifestyle. In the beginning, "it never occurred to us" to put Muntz's face on the billboards because no one had advertised that way before, Shore said. But by the time he got into the TV business, everyone recognized his caricature and he decided to stick with it. "Earl Muntz was a fun-loving guy who could think outside the box," said filmmaker Judy ver Mehr, who with her husband, Dan Bunker, directed and produced the independent 2005 documentary "Madman Muntz: American Maverick." Muntz was born in 1914 and grew up in Elgin, Ill., where, at a very early age, he exhibited a talent for sales. At 8, he began repairing and selling radios for his father, William Muntz, a distributor of radios and radio parts. He dropped out of high school and began fixing up and selling old Model T Fords and soon had a thriving business. Because he was so young, his mother had to sign all of the sales contracts. In 1941, when Muntz heard that cars were selling in California for much higher profits, he headed to Glendale, where he opened his first used-car lot at age 27. One of his early business gambits - the purchase of 13 right-side-driver cars he had planned to sell to overseas buyers - nearly failed when World War II stymied their export. Muntz got an early lesson in the power of publicity, however, when a local newspaper story about his plight stirred enough interest in the cars to enable him to sell them all. Soon after, Muntz hired Shore, who came up with the madman campaign theme. "I wanna give 'em away," an actor portraying Muntz screamed, "But Mrs. Muntz won't let me. She's crazy!" Because of wartime gas rationing, Shore recalled, "people were selling their cars and Muntz picked them up cheap." So Shore came up with another ad slogan: "Walking is good for you: sell your car to Muntz." In 1943, Muntz opened a used-car business at 11th and Figueroa streets downtown. Some of the period's biggest comedians - Bob Hope, Jack Benny and Red Skelton - used the "Madman Muntz" scheme in some of their routines, and each of their, seemingly endless jokes raised the used-car salesman's profile ever higher and brought him more business. During this period, Muntz ran 176 60-second commercials every day on 13 Los Angeles radio stations, according to Times stories. After the war, he branched into selling new cars, and his downtown dealership became a regular stop for tour buses, which pulled up in front of a billboard touting good deals on Kaiser-Frazer sedans: "I buy 'em retail and sell 'em wholesale. It's more fun that way." After the cars came the television sets. In 1948, when television was just beginning to catch on with the public, he manufactured and peddled TV sets. "Stop staring at your radio!" was one of his ad slogans. By 1949, Muntz was manufacturing and selling 5,000 TV sets a month, enticing customers by mailing out TV knobs with a note that read, "Call and we'll show up with the rest of the set." In 1952, at the peak of his company's success, he sold $55 million in TV sets at 72 stores nationwide. The large volume enabled him to sell sets at low prices and still make a profit. But not everything he touched turned golden. In the early 1950s, he built the Muntz Jet, a sports car that sold for $5,500 - a large sum then. He added seat belts, padded dashboards, a liquor cabinet and ice chest. He painted the 300 to 400 cars he built bright red, pink, yellow or purple. He lost his shirt on the venture. 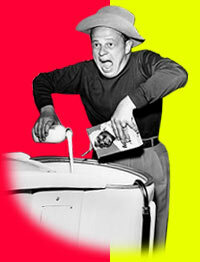 By 1957, Muntz was out of the TV business, as color sets began replacing the simple black-and-whites that he had manufactured. By the early 1960s, however, he had a new venture: a four-track car audio system. He sold and installed the Muntz Stereo-Pak at his Sunset Boulevard store, where beautiful girls worked the counter in fishnet stockings and short skirts. Muntz once said he never minded losing a fortune because "it was so damn much fun making another one." As a publicity stunt, he even sent a buxom model to Vietnam to pass out Stereo-Paks to the GIs. But the federal government turned down his offer to install them in Jeeps. Muntz paid some of his employees an extra $50 a month to drive around in white Ford Mustangs adorned with advertising. He said, "It makes them better employees. They're Muntz-A-Fied!" In 1968, Muntz moved his electronics business to a Van Nuys warehouse and added new ventures, including building aluminum homes and renting motorcycles and motor homes, which he dubbed Muntz Motor Mansions. None of these ventures did very well. Muntz had about as many wives - seven - as he did business ventures. He admittedly had a "hard time keeping their names straight" yet claimed to have remained friends with them after the divorces, calling their new spouses his "husband-in-laws." He never lacked for female friends, including comedian Phyllis Diller, whose photo hung in his office and Was signed, "My friend Earl stereo-ed my entire body," according to a Times story. He loved to cook and entertain celebrities and other friends at his home. He drank highballs, smoked Lucky Strikes and drove a custom-built 1984 Lincoln Continental with a TV and VCR built into the dashboard. He still was selling car stereos, cell- phones and other electronics until d shortly before he died of lung cancer in 1987 at age 73. His pioneering efforts won him post, humous induction into the Consumer Electronics Hall of Fame in 2001.